Our personalised trays come in four sizes to meet any dining or desk need. From serving tea and biscuits to organising stationery, these bespoke lap trays personalised by you make a fun photo gift or accessory for your home. Print your designs, special messages or as a colourful photo collage tray, to make your personalised tray truly unique. 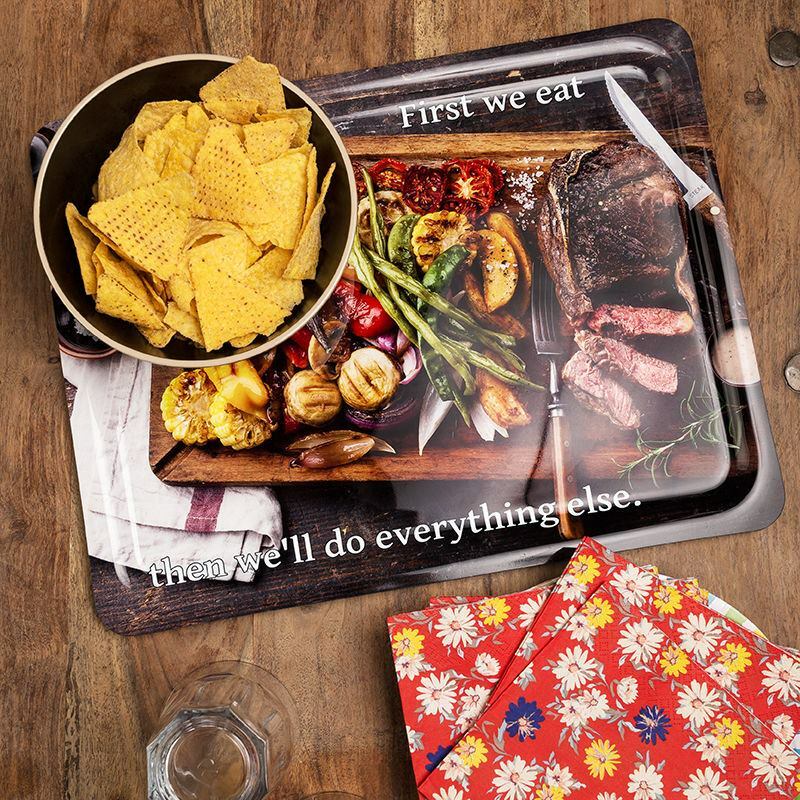 Whether you want to sit down with the family to enjoy dinner in front of the box or simply have a place for those random bits and pieces, these personalised lap trays come in four sizes to suit a variety of uses. Made from 3.25 mm thick scratchproof plastic, they’re also ideal as a kids lap tv tray that they can play on or a beautiful photo tray gift. Your photo tray has a slightly curved lip around the edges to stop things from sliding off when you’re sat down eating or carrying it out of the kitchen, great if you are using it as a food tray. Your photo or design is printed edge-to-edge for a flawless look, and the reverse remains a plain white glossy plastic. The tray i ordered is usable and a perfect gift. It was easy to follow the instructions to do what I wanted to do and delivery was quick. Thank you for the prompt service and I'm delighted with the quality of the photo tray. It arrived within 3 days of ordering, well packaged and everyone who has seen it is blown away by the quality of the image. These personalised lap trays are ideal for serving afternoon tea or coffee with biscuits. Enjoy your favourite dinner on your very own custom photo tray for a relaxed night in front of the television. Big enough for your dinner plate, napkins and a drink, you’ll be set for the evening! Use as a buffet tray to display canapes and nibbles, or put it on your sofa arm to keep the remote safe from channel switchers! Handy storage tray for bits and bobs like pens, keys, clips, staples. Heavy duty keys or coins are no match for this scratchproof plastic. Care: the glossy surface is easily wiped with a damp cloth. Rinse and wipe by hand. Do not use in the dishwasher. Because of our strong, tough print, we give a three-year guarantee on print, and product structure. If you're using as a tray table, we do not advise to use your tray for extremely hot dishes over 90°C. If you do so, the material will start to soften/distort. Cups of tea are of course, absolutely fine. Who Would Love a Photo Tray Gift? These personalised photo trays are so convenient and can be used in any way you want. Treat grandma to a personalised tray for the side table, ideal for keeping keys, tickets or bus passes and makes great gifts. Give your family’s dinner time a makeover with personalised tea trays, customised with everyone’s name so there are no squabbles over who gets the last photo tray. Dads, husbands and brothers will love a small photo tray to keep their loose change in, and we’re pretty sure the rest of the household will appreciate not having to hear the jingling of money every time they get up! Like many of our products, the personalised photo trays come with a quantity discount, so why not buy the whole set today and save money. Your personalised photo tray is formed and printed to order in London, UK by our expert print technicians. Your photograph or design are printed edge-to-edge using our specialist digital printing process so your personalised tray images have a long life. Everything is finished with hand to make sure your tray is nothing short of perfect. Photos print sharply, so even high-definition images will look ready to pop out from the tray! When you design your own personalised lap trays, plan for your image to be centred and ensure any fine details are away from the curved lip to avoid distortion. Lap trays for eating look great when printed with mouth-watering images of tasty meals, so even if you are laying off the carbs, at least you’re not missing out entirely! Keeping with the food theme, print various quotes from the best chefs onto dinner lap trays that will inspire you to rustle up more delicious food. The long slim rectangle personalised serving tray is ideal for offering canapes and hors-d'oeuvres when you’re entertaining guests or line up your champagne flutes for a stunning display. Customise with a photo collage of wine labels for a chic and arty design. Personalised photo trays are so eye-catching when designed as a photo collage tray. Printed with holiday snaps, wedding pictures or even a collection of celebrity crush images, the photo tray gift is both practical and meaningful. These knee trays are great to design as face presents. The small desk personalised tray is a cool novelty gift for your creative colleague, or buy one as a hint to your messy co-worker! Their compact, cute size also makes these small photo trays a nice feature for your mum’s or wife’s dressing tables. They’ll be eternally grateful to have a place to keep all their hair grips or spare buttons that always seem to disappear. Print patterns to suit their style, such as vintage floral or blingtastic!